As we saw in the first article, Dispensationalists insist that the church has temporarily replaced Israel in God’s scheme. This church -v- Israel distinction is foundational to the Dispensational view. The idea that the church was unknown, unpredicted, un-prophesied in the OT is one of the pillars of Dispensationalism and their charge of Replacement Theology against non-Dispensationalists. “The existence of this present age which was to interrupt God’s established program with Israel, was a mystery (Matthew 13:11).” (Dwight Pentecost, Things to Come, Grand Rapids, Zondervan, 1980) 134). “The existence of an entirely new age which only interrupts temporarily God’s program for Israel, is one of the strongest arguments for the premillennial position. It is necessary for one who rejects that interpretation to prove that the church itself is the consummation of God’s program” (p. 136). “The concept must stand that this whole age with its program was not revealed in the Old Testament, but constitutes a new program and a new line of revelation in this present age….It has been illustrated how this whole age existed in the mind of God without having been revealed in the Old Testament.” (P. 137). “Inasmuch as many passages in the NT such as Ephesians 3.1-6; colossians 1.24-27 make it clear that the church is a mystery and its nature as a body composed of jew and Gentile alike was unrevealed in the O.T., the church could not have been in view in this or any other O.T. prophecy. (195). “Church was entirely unknown in the OT.” (201). “The church is manifestly an interruption of God’s program for Israel. (467). Was the Church Not Predicted in the Old Covenant Promises to Israel? Make no mistake, if the church was foretold in the OT, as a key element of God’s promises to Israel, Dispensationalism’s claims about Replacement Theology are totally falsified! In one of my presentations at the just completed Preterist Pilgrim Weekend, July 2015, I presented evidence proving that the Old Covenant did in fact not only predict that establishment of the church, as a fundamental aspect of God’s promises to Israel. But, keep this fact in mind, a fact touched on in our previous article: Paul was a faithful Jew and he said he preached nothing but the hope of Israel found in Moses, the law and the prophets. The significance of this is profoundly devastating to the Dispensational view! Not only did Paul say he preached nothing but the hope of Israel, he said that there was “one hope” (Ephesians 4:4-5). Now, according to the Dispensationalists, there are two distinct, separate eschatological hopes! There is the Old Covenant hope of Israel- the nationalistic Messianic Kingdom hope and then, there is the Gentile hope– which is for the church. But, Paul knew nothing of such a bi-furcation of God’s eschatological plan. There was ONE hope – not two. Not two people with two covenants! 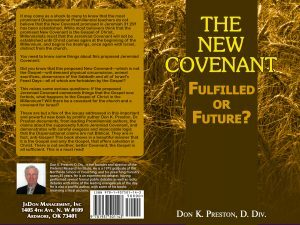 (See my brand new book, The New Covenant: Future or Fulfilled? for a powerful study on the New Covenant, and refutation of the Dispensational claim that the New Covenant of Jeremiah 31 has not yet been established). 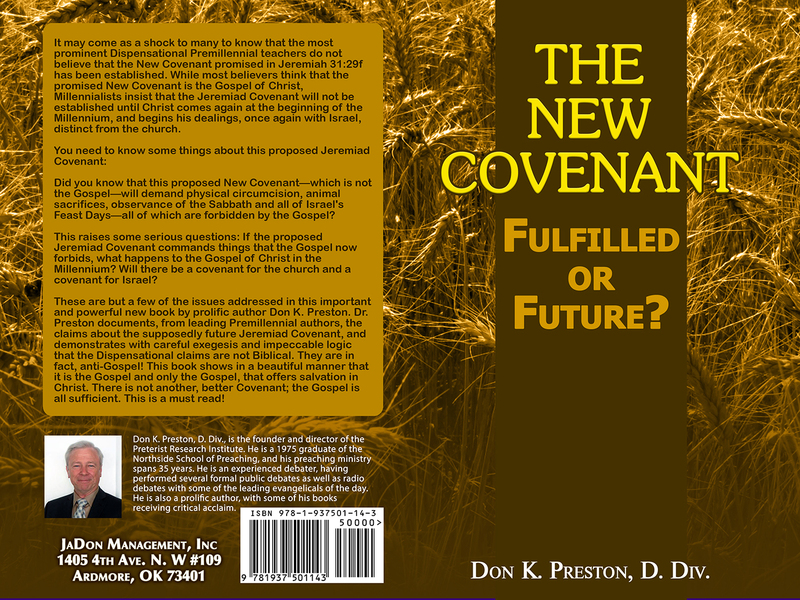 But, to the point of whether the church was foretold in the Old Covenant promises to Israel. While we could produce numerous OT prophecies demonstrating this irrefutable truth, take note of major text that even the Dispensationalists agree referred to the church and the current gospel age of grace. (Yes, that is a contradiction, as we shall see). The Lord shall send the rod of Your strength out of Zion. Rule in the midst of Your enemies!’” (Psalms 110:1). This amazing text is cited, echoed and quoted by the NT writers more than any other OT prophecy – some 32 times (CF. A.G. Hebert, The Throne of David, A Study of the Fulfillment of the Old Testament in Jesus and His Church, (London, Faber and Faber Limited, 1941)! It is quoted by Peter in Acts 2, to speak of Christ’s resurrection and ascension. And – catch the power of this – I do not know of a Dispensational writer that denies Psalms 110 was fulfilled in Christ’s ascension and in the events of Pentecost! Walvoord said Psalms 110 was fulfilled in Christ’s ascension: (John Walvoord, Major Bible Prophecies, (Grand Rapids, Zondervan, 1991)108-109, see also p. 365). (Walvoord sought to escape the problem that this admission presents by claiming that Psalms 110 is not a Davidic prophecy- but that is patently false)! Thomas Ice and Timothy Demy say, “At the present time he is in heaven awaiting his time of triumph over his enemies (Psalms 110:1,2)” ( Thomas Ice and Timothy Demy, Prophecy Watch, (Eugene, Or. Harvest House, 1998)260). Psalms 110 was a prediction of the enthronement and rule of Jesus. Psalms 110 was fulfilled in the Ascension and the events of Pentecost – admitted by virtually all Dispensationalists. But, the events of Pentecost (based on the Ascension)- included the establishment / birth of the church! Therefore, Psalms 110 foretold the establishment of the church! Since virtually no Dispensationalist denies that Psalms 110 was fulfilled on Pentecost, and since what happened on Pentecost included the establishment of the church, it is prima facie proof that the Old Covenant did predict the establishment of the church, and thus, one of the key pillars of Dispensationalism falls to the ground. The implications of this (fatal) admission are profound, since the church included the inclusion of the Gentiles – as equal participants with Israel – of the blessings of Christ! Add to all of this Peter’s emphatic declaration (Acts 2:15f) that the out-pouring of the Spirit on Pentecost was the fulfillment of Joel 2:28f: “This is that which was spoken by the prophet Joel” and you have overwhelming proof that no Replacement Theology was being proclaimed! What cannot be missed also is that while Dispensationalism says the church is a manifestation of the “times of the Gentiles” (part and parcel of, though not synonymous with it) it is undeniable that on Pentecost, it was the Jews out of every nation under heaven that accepted the gospel of Christ, as the fulfillment of their hopes, of their promises, of their prophecies! Pentecost was not the setting aside of Israel to bring in the Gentiles! There is no reverse Replacement Theology in Acts 2! There is not one word in Acts 2 about the failure of God’s OT promises to Israel. There is not one word about the postponement of God’s promises. There is not a word about an alteration of the Plan. Every word from Peter’s mouth on Pentecost spoke of the fulfillment of God’s Old Covenant promises made to Israel– thus, any idea that what happened on Pentecost was an unforeseen “Replacement Theology” of the church temporarily replacing Israel is totally false. And there is much more to see, as we continue this examination, so stay tuned!